This is the Microsoft Lumia 540 Case online in Pakistan that is imported from Amazon in Pakistan. 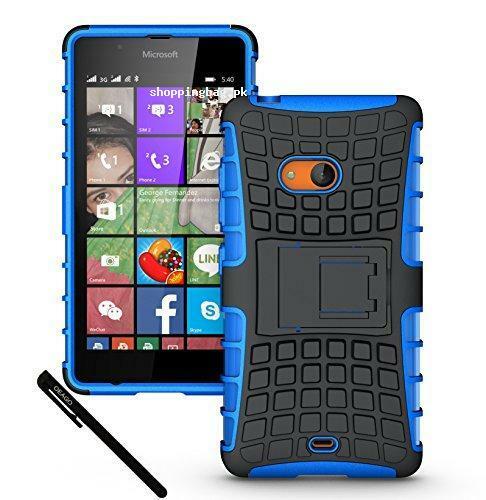 This imported case is now available for Microsoft Lumia 540 Case online shopping in Pakistan. It is high quality tough case that is exclusively designed for Microsoft Lumia 540. It is highly protective dual layer case for the mobile phone in shield style. It has the shock absorbing technology to save the mobile from bumps and drops. This back cover is made with high quality hard plastic and double thick TPU for the protection of phone. Enjoy doing Microsoft Lumia 540 back case online shopping in Pakistan. Check this imported from Amazon Microsoft Lumia 540 Case price in Pakistan and you can buy this for you. It also has a built in kick stand for easy watching videos and enjoy more. Here it is available in black and vibrant blue color that you can buy for your Microsoft Lumia 540. This is the genuine OEAGO product that is imported for you. It is easy to install and protect your phone from bumps, scratches and drops. Buy Microsoft Lumia 540 Case online in Pakistan. Place your order now and you can get this product at your doorstep with cash on delivery all over Pakistan. Enjoy Microsoft Lumia 540 Case online shopping in Pakistan and find a range of more products in our online store that are imported from Amazon in Pakistan exclusively for the consumers in Pakistan. At our online store you can find imported products in reasonable price in Pakistan. Enjoy Amazon online shopping in Pakistan. Dual Layer shield style case specially designed for Microsoft Lumia 540 Only. Corners feature double-thick TPU for extra enhanced safeguard to preserve the life of your valuable Microsoft Lumia 540 Smart Phone.